John Metcalf got his start racing go-karts as an 8 year old against his brother and father in Scottsbluff, Nebraska. He continued to race go-karts until he was 15, when he built a 1955 Chevy stock car the he and his brother raced, winning many races at the local tracks in Gering and Alliance, Nebraska, and Cheyenne, Wyoming. While working at an auto dealership in Scottsbluff,John began building and racing jet boats. John moved to Colorado in 1974, andwhile he was still racing boats, his passion for stock car racing remained strong. John began working with Late Model racer Mike Bonnicelli, and they built a car they raced in Charlotte, Darlington, and Daytona in NASCAR’s Grand National division. In the mid 1980’s, John built his own late model stock car, and his career as a driver was on. John competed whenever and wherever he could, traveling the western U.S. to compete at tracks throughout the region. In 1989, Mike Opperman asked John to be the crew chief for his race team at the newly-paved Colorado National Speedway. The team was immediately successful, winning the Late Model champion that year. The following year, John drove for Mike and finished second in points for the championship. John then bought Mike’s car, and raced it to numerous main event wins, finishing in the top five in championship points for the next five years. John again joined forces with Mike Bonnicelli in 1996, and the team won 7 poles and many races. 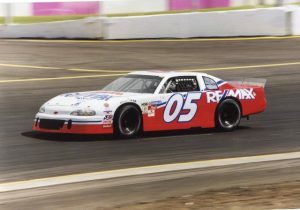 After meeting race team operator and Late Model driver Dave Lineger, John was then asked to run the Team Remax Racing, a position he considered to be a dream come true. From 1997 to 2003, John served in dual roles as team manager and driver, winning Rookie of the year honors in the Southwest Series and finishing 4th championship points in Nascar’s Winston West Series in 2000. In 2001 and 2002, John competedin the national RemaxArca Series. In 2003, the team built a Corvette for road racing. At the 24-hour Rolex race at Daytona they were leading until motor failure forced them out of the race. They went on to win at Watkins Glen and had three podium finishes for the season. John Retired from racing in 2003 with career statistics of 638 starts, and 116 pole positions. InSouthwest Tour Division, Winston West Series, and Arca Series, John’s raced his way to 204 victories, 376 top 5 finishes, 390 top 10 finishes. Hetied for the Late Model division championship at Colorado National Speedway in 1993, and has one championship as a crew chief to his credit. After retiring from active competition, Johnstarted C-4HotRods,buildingpremiercarsthathavegainednational exposure, and helped his grandson BrandanwintheColoradoKidKartchampionship,winningall7races in a season. John was inducted into the Colorado Motorsports Hall of Fame as part of the Class of 2018.